State Rep. Jared C. Brossett, right, D-New Orleans, introduced legislation to allow single people to adopt. A House panel killed his bill. Photo courtesy of The Advocate. 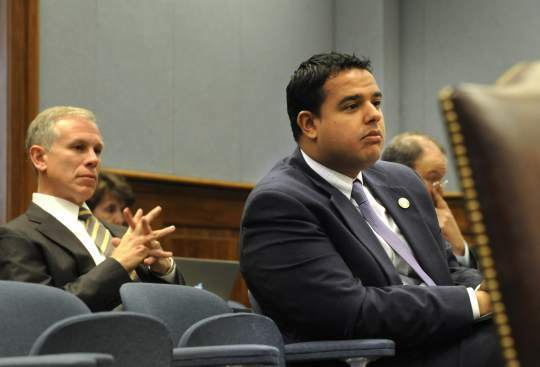 A Louisiana House committee on Tuesday killed legislation that would have allowed unmarried partners to adopt children, according to this article in The Advocate. Critics of the legislation said the bill would have allowed boyfriends, girlfriends and gay people to adopt. The best indication of a couple’s commitment to adoption is the fact they are married, one critic said. However Carmen Weisner, executive director of the National Association of Social Workers Louisiana Chapter, said the state’s ban on unmarried partners adopting children does not reflect reality. In fact, about one out of three of Louisiana’s 1.1 million families was headed by a single parent in 2010. Weisner said if a single person adopts a child, an adult they have a relationship with has no legal parental rights under state law. Such a situation can keep a child from having access to healthcare insurance, Social Security benefits or the right to inherit, Weisner said. Social workers often help children find loving homes through adoption. To learn more visit the National Association of Social Workers’ “Help Starts Here” Adoptions and Foster Care website by clicking here. Social workers are also committed to equal treatment for all, including LGBT individuals. Learn more by visiting NASW’s Diversity and Equity website by clicking here.